The first time I ever had shashuka was in the fall of 2016 at Jack's Wife Freda in New York City. Most brunch restaurants that I visit don't don't offer this dish. If you do recommend shashuka in Toronto, give us suggestions in the comments below! My love for the dish returned last year when we had brunch in Toronto's La Palma and immediately, we knew we had to blog about how delicious it is. 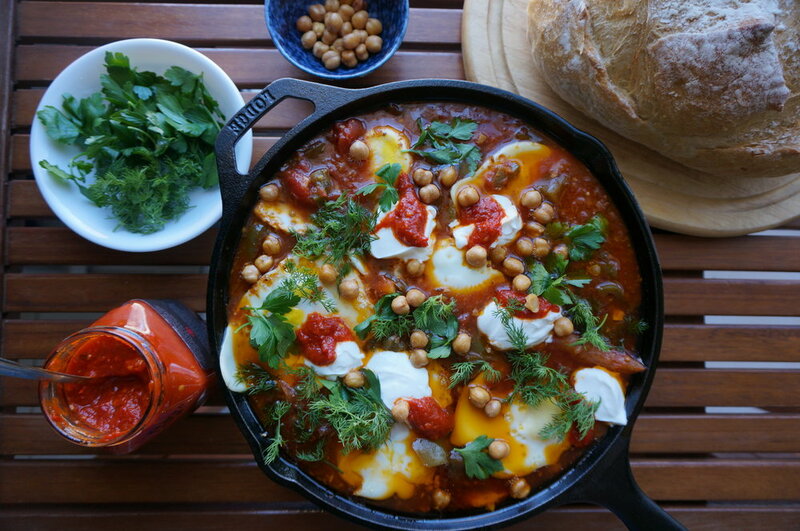 When you search restaurants to try in NYC, Egg Shop is always at the top of the lists for breakfast and we managed to find a shashuka recipe in their recently published cookbook. 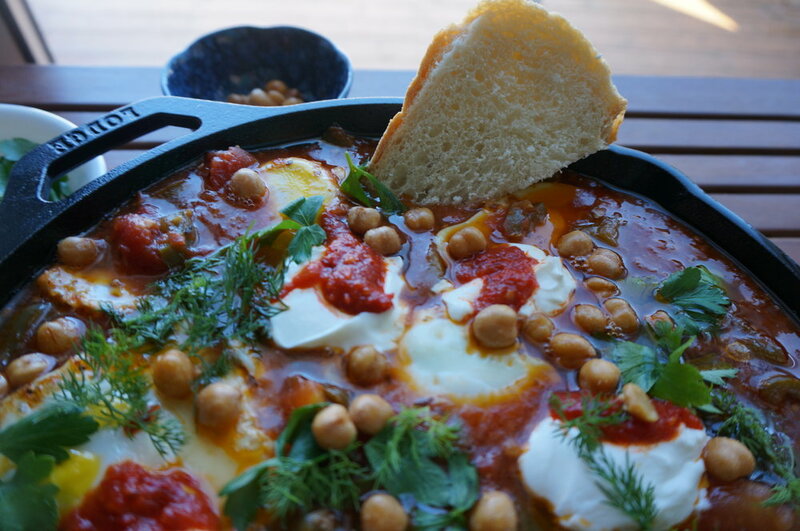 It's incredible how at first glance, it looks like a simple dish: tomato base and eggs, but the shashuka is full of complexities that make it what is it: z'attar, harissa sauce, cumin seeds, caraway seeds, and who knew - honey! The spices fused with the tomato sauce, topped with fresh cilantro and dill, then dipped with fresh bread, spread with greek yogurt and harissa sauce then coupled with a yolky egg. So many things happening at once, but my stomach was a bottomless pit that kept on wanting more. These are the type of dishes I appreciate most. The ones that can be shared, feel homey and appear simple to cook up, but there are so many components to making it what it is. 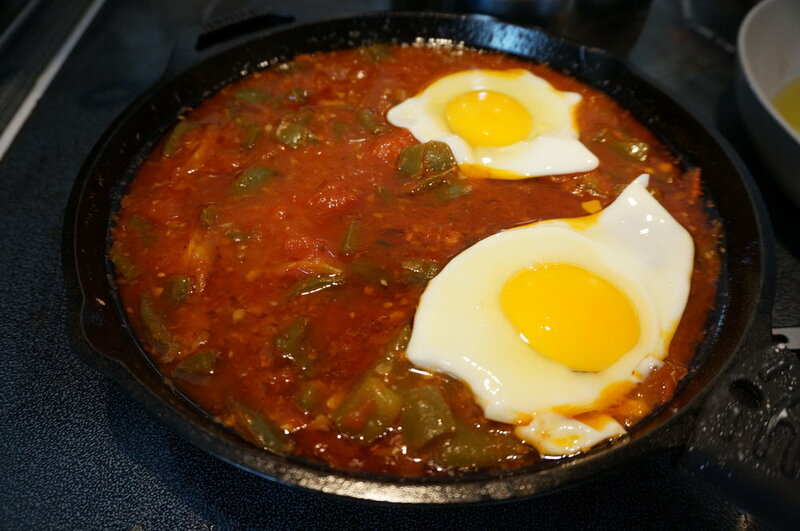 And of course we modified the Egg Shop's recipe a bit since we couldn't find some ingredients like fresno pepper. Doing what we can under pressure!